Our Bloody Mary has developed a bit of a following. We tend to make quite a few of these on the weekends. Regardless of what the masses think we invite you to try for yourself. At $2.50 a piece, they are worth every penny. We let you decide. We serve breakfast or lunch whenever we are open. Doc Taylor's is the little brother of Tautog's, a Va Beach seafood restaurant slash 23rd street institution that happens to be right next door. Our "Allstar cast" of cooks and servers quitely delivers the best affordable breakfast on the oceanfront. But don't take our word for it. Read what others have been saying about us. We aim to make food that satisfies the soul. 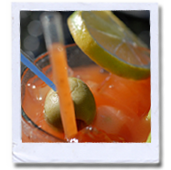 Have you tried our Bloody Mary's? How about starting your day with a classic east coast breakie? Two eggs any style, French toast and bacon. It’s a dynamite combination! Crispy fried catfish on a sub roll with lettuce, tomato & granny smith apple tartar sauce. Named after our friends on 36th street! This club will tackle an empty stomach on a hot day like no other. This is one is a classic. This is Ice Cream the way the Doctor would have liked it. Tuck in and enjoy!